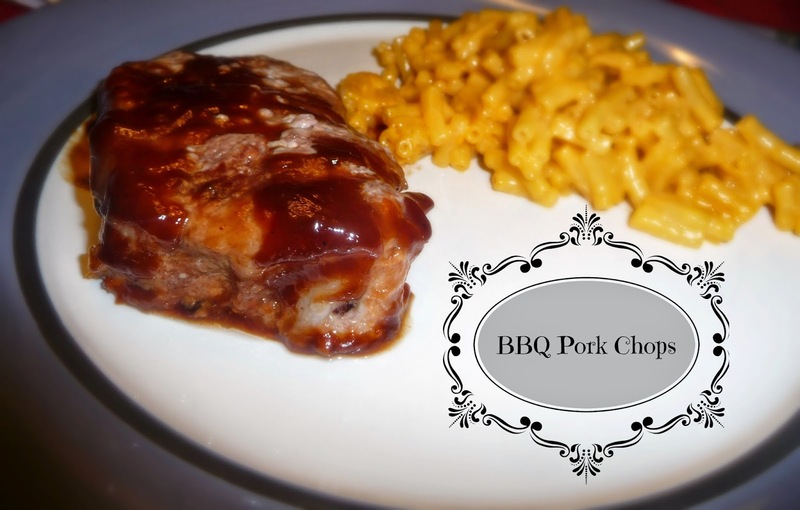 In the past when I would make pork chops, I would just put them in the oven and bake them. My husband was not too fond of it so I decided that I would continue to make them the way I normally do, but added some BBQ sauce to them. I got two nice size pork chops and Sweet Baby Rays Honey Barbeque Sauce. I know that you can make your own wonderful sauce, but to make it an easy fast meal this is the next best thing. Preheat your oven to 375 degrees. Put the pork chops on a cookie tray. You'll want to poke holes in the meat with a fork. Pour the BBQ sauce on the chops and cover the side completely. Flip the pork chops over. With your fork, poke holes on this side. Pour the BBQ sauce on the chops and cover the side completely. Put your chops in the oven for 30 minutes. Add any yummy side. I added Kraft mac-n-cheese since Michael loves it. So there you have it, a supper yummy and quick dinner that your family and mine will love!